Long-buried World War II munitions are being removed, one piece at a time. A large project to remove World War II-era munitions is underway this week at Long Point Wildlife Refuge and a section of privately-owned barrier beach off the Tisbury Great Pond. 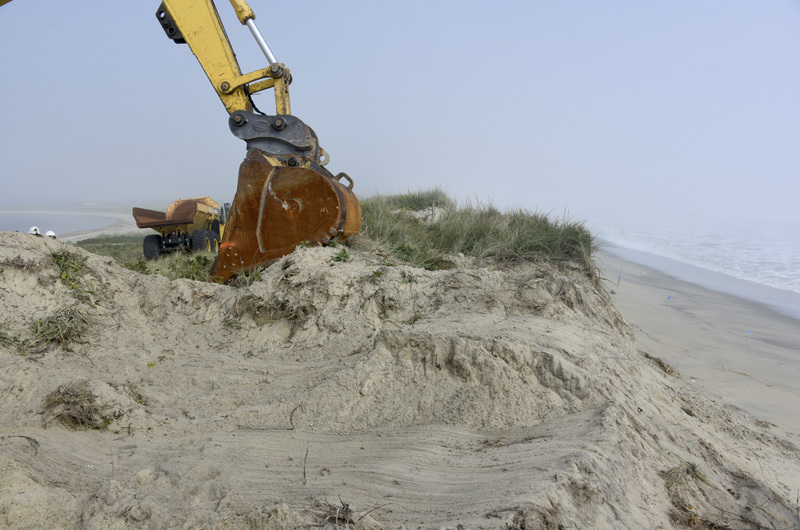 The $8.1 million Army Corps of Engineers project includes removing and rebuilding several hundred feet of dune along the barrier beach to unearth any munitions buried underneath. 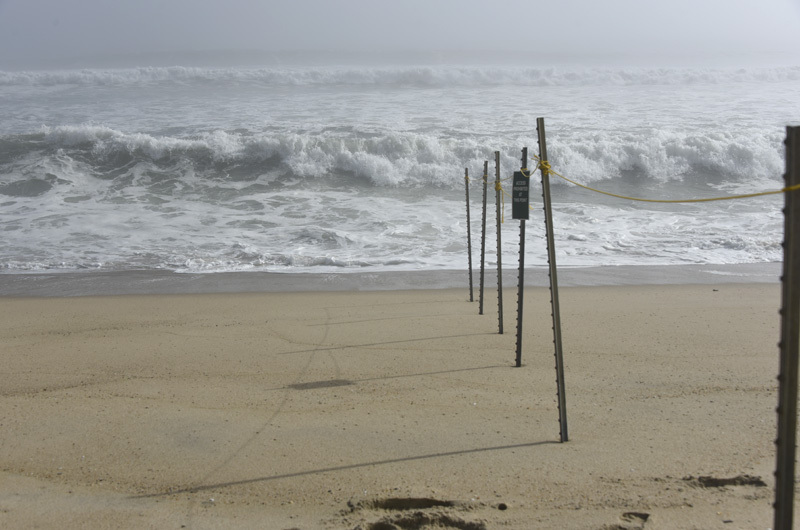 This week at Long Point heavy surf churned up by tropical storms pounded the beach, which was largely empty. Large machinery joined a fleet of pickup trucks on the upland area between the barrier beach and the pond. Monarch butterflies flitted around fluorescent flags that indicated so-called anomalies, suspicious items that could be nothing or could be a 70-year-old bomb. 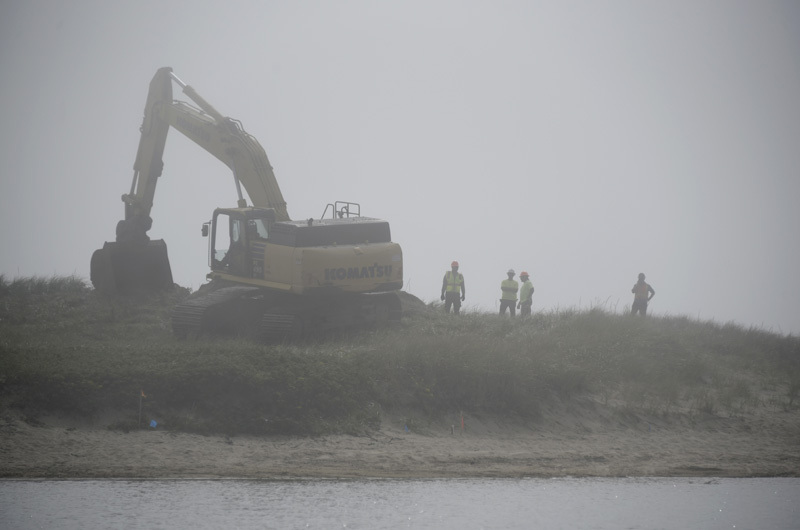 A cratered pile of sand marked where a 100-pound photo flash bomb was detonated in June, and a yellow excavator perched atop the dune nearby, where the sand was newly pulled away. The Long Point project is part of a broader effort to remove World War II practice bombs and small arms rounds buried in Vineyard beaches from long-ago bombing practice. A similar project at the Little Neck area on Chappaquiddick is wrapping up after a year and a half. The cost of both projects is tagged at roughly $22 million. Long Point, which is owned and managed by The Trustees of Reservations, will remain open, though some areas will be closed to the public as removal unfolds. The bulk of the project is slated to end in December, with maintenance and restoration resuming in the spring and continuing through 2019. Tisbury Great Pond was one of several areas on the Vineyard and in New England used as a practice dive bombing and strafing range from August 1943 to July 1947. According to the Army Corps, targets were constructed to help military pilots develop gunnery and bombing skills. Military practice ordnance potentially used include miniature practice bombs between one and three pounds, practice bombs between 100 and 500 pounds, and small arms rounds. Munitions or pieces of munitions were left littered on the beach, eventually covered with sand and migrating over time out into the ocean and under the Great Pond. Preliminary work began years ago, including aerial surveys to identify potential bombs, feasibility and environmental studies, and public meetings. The project began in earnest on the site last spring. In June the photo bomb was discovered and detonated, which delayed the removal process. An algae bloom on the Great Pond delayed underwater surveys. Project manager Carol Charette said the munition removal is especially important at the pond, which is often opened to the ocean. When that happens, she said, munitions have been forced out of the pond and into the ocean by the current. Areas of land marked with anomalies will be further investigated and taken care of. Part of the pond has also been surveyed, and trained divers will go back to further investigate marked areas. Divers will also investigate part of the ocean, identifying items of concern and removing them immediately. The most dramatic munition removal will take place along about 700 feet of dune lining the beach. Work will begin at the western end, near where the barrier beach begins. The very end of the dune was untouched to protect two stalks of seabeach knotweed, a species of special concern. Workers will return to that part of the dune in the later fall, after the plant has died back and been moved. 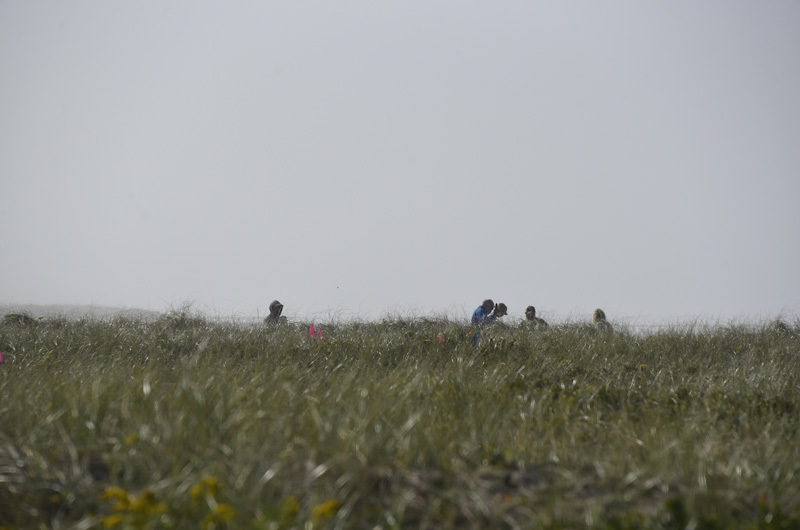 Working in 200-foot sections, the crew will take off the top layer of beach grass and then take out a layer at a time, stopping to survey the sand below along the way. The sand is stockpiled and used to fill in the new section. Any munitions found will be immediately dealt with. The dune will be rebuilt to its former condition after the project, Ms. Charette said, with beach grass replanted and established on top. Dune removal is rare but not unprecedented for this type of project, Ms. Charette said. The only other dune project she can recall for the New England Corps was on South Beach in Edgartown the late 1980s. The dune was removed and rebuilt from Atlantic Drive to the mean low tide, she said. Mr. Kennedy said he felt confident the beach grass would come back. “That’s the beauty of beach grass,” he said, noting that once the rhizomes are re-established, the plant can grow through several feet of sand. Local permitting is not required and in fact prohibited for the Army Corps, Ms. Charette said. The Army follows a process called Comprehensive Environmental Response, Compensation, and Liability Act, which makes the Corps exempt from having to obtain permits. Instead the Corps does informal coordination with environmental agencies to make sure regulations are followed, Ms. Charette said. “We’re actually following the substantive requirements that he permit would require us to do,” she said. Environmental surveys were taken to look at impact on nesting shorebirds, she said. There were also extensive surveys for Northeastern Beach tiger beetles, an endangered beetle known to live on the Vineyard’s south shore. Both Mr. Kennedy and Ms. Charette said surveys showed the beetles were not present at the excavation site. With ocean and pond-facing beaches and trails, Long Point is a popular destination for walkers, kayakers and beachgoers. The western part of the beach has been closed to the public, and as work unfolds people are not allowed within a 369-foot area around the workers. “It will be tough for some members of the public this fall to not go wherever they want at Long Point,” Mr. Kennedy said. The area is also in the path of one of the runways at Martha’s Vineyard Airport. The team notifies the Federal Aviation Administration when munitions are detonated. While most of the work is taking place on Trustees property, a large part of the barrier beach is privately owned by the Jones family under the Tssisa Corporation. The family also owns a large portion of land along the pond. Mal Jones said his family agreed to the bomb removal with a stipulation that work not take place during the shorebird nesting season. The government objected to the stipulation and took action against the Tsissa Corporation in superior court to seek access to the property. In July a Suffolk County judge ordered the family corporation to allow access to the state Department of Environmental Protection and the Army Corps for the munitions removal work. 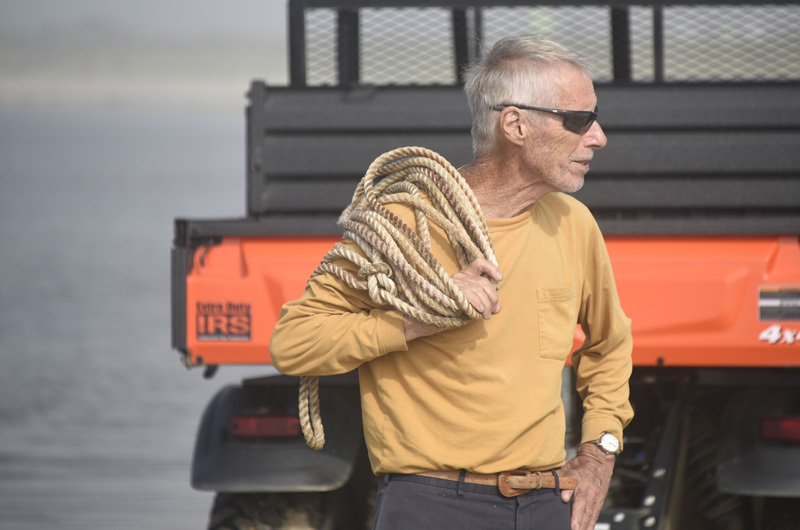 On Wednesday afternoon he headed out across Deep Bottom Cove to the work site, on a mission to salvage a long fuel line that had washed up on his beach. After motoring back across the cove, fuel line in tow, Mr. Jones expressed some ambivalence about the project. 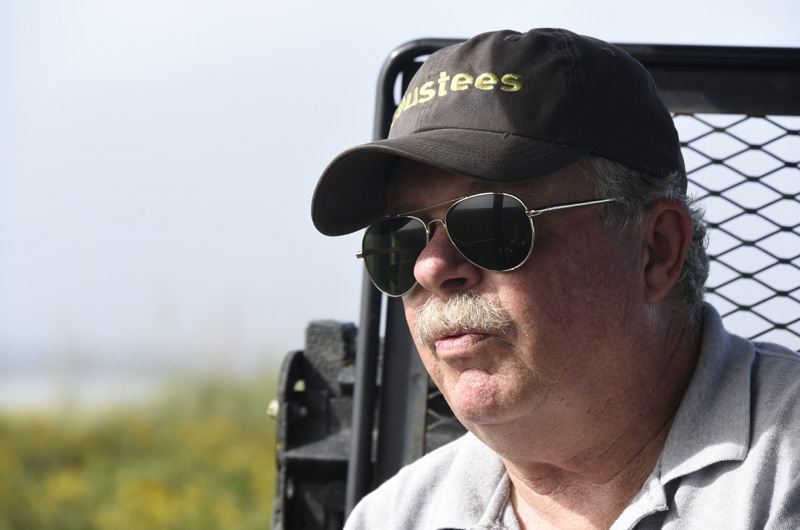 While he’s concerned about the shorebirds, and no one has been injured on the Vineyard beach as far as he knows, he said he felt all munitions should be considered dangerous unless proven otherwise. “Having been blown up by a supposed safe weapon or a bomb when I was a kid . . . I’m a little cautious about it. More photos of Long Point munitions removal. Why isn't Tom Rancich's company involved in this project. He lives on Martha's Vineyard, and is an expert in this field !? Tony, Tom's company, VRH, Inc., is in charge of all the underwater uxo work at both Cape Pogue and at Long Point. They're doing a great job and are very professional. Chris, thank you for the clarification. Hope all is well. The Japanese attack on Pearl Harbor, on Dec.